Poured in place concrete forming requires hauling, curing and storing materials. Forming, pouring and stripping forms is a week-long process. cialis generique Delays from concrete trucks arriving late range from inconvenient to causing cold joints – weak and water susceptible micro-cracks due to one pour setting before the next pour is placed. Concrete cures in stages and must be finished during curing time. Any delay during the day creates overtime issues, disgruntlement and increased weather risk. Delays in your operations or problems accomplishing the pour efficiently leads to the risk that concrete will set up in the truck. The driver may suggest adding water to stretch the mix, but this strategy leads to weaker concrete and poor slump results, and you are responsible for performing on-site strength tests. Pre-cast concrete eliminates the concrete mix issues. The precast walls are formed in a warehouse where temperature and weather are not a factor because construction happens in a controlled environment. Additionally, pre-cast reduces the weather risk by eliminating on-site days required to finish work stages. Poured in place concrete requires three separate days to pour the base, walls and top. Curing and stripping ads one day to each step, requiring six days to cast on site. Chief among safety issues on construction sites concerns excavations remaining open, even overnight. Your excavation site will be open as long as there are forms to be delivered, concrete trucks to arrive, and concrete to poured, cured and stripped. Pre-cast concrete can be set in place in one day since the concrete is formed and cured off site, then delivered and placed in sections. Pre-cast concrete applications can be limited to excavations opening as needed and closing that day. Usual methods will leave excavations open for one day rather than six. Since the pre-cast is stored off-site and delivered at the time you need it, the theft risk greatly reduces. And yes, concrete is stolen off sites. Poured in place concrete can be affected by meteorological conditions in many ways. Cold, wet conditions slow down curing times. Hot temperatures speed curing time to the point the concrete is unworkable quickly. The concrete curing process is exothermic – it releases heat. When https://www.acheterviagrafr24.com/prix-viagra-pharmacie/ workers must deal with hot weather exacerbated by curing concrete, conditions mirror ovens. Pre-cast concrete are formed in a warehouse where weather will never delay your project or affect the integrity of the concrete. Pre-cast concrete is batched and stored. Any failure of a particular batch disqualifies those components in quality control. A total tear-down is unnecessary. Poured in place concrete work is formed in place, requiring large resources of forming materials, shoring scaffolds, and labor. Pre-cast concrete reduces on-site labor costs in two ways. First, less labor is required. It only a 3 man team to install up to 400+ feet of fence wall per day. The second way that labor costs are reduced is that with precast concrete walls, the labor can be less skilled and a lot less time is required. Poured in place concrete requires room at your work site for the cement mixing truck, cranes, workers vehicles, and forming equipment. 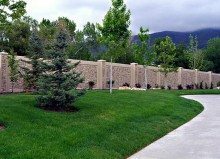 Pre-cast concrete saves site space by reducing storage requirements and needing less work space for construction traffic and labor during placement. Clearly, where pre-cast is possible, it is the superior choice! 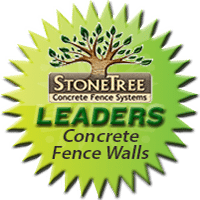 Contact StoneTree® Concrete Fence Wall Systems for all of your fencing needs at 801-281-2262.